Boston launched its own bike-sharing program last week- ‘The Hubway.’ There has been a lot of talk about how a bike sharing scheme would work out in a city like Boston where one reads about car drivers showing intolerance to those on bikes and bikers showing intolerance to pedestrians, roller bladers and others with whom they have to share their space and vice versa. There is more curiosity about bike sharing itself because a lot of major bike sharing programs the world over like the Vélib in Paris (bikes have been stolen or gone missing), Orange Bike Project in Tucson, Arizona or CityBikes in Copenhagen (vandalism) or Melbourne Bike Share (low ridership because of the laws that make wearing a helmet mandatory) have suffered setbacks at some point or the other. Knowing all of this, I was definitely curious to see how Boston’s newest bike sharing system works out. Bikes are not new to Boston’s streets and over the last several years, Mayor Menino has taken it upon himself to have Boston recognized as one of the major bike cities in the world (Boston Bikes is his vision). The city has an extensive bike network into which, the Hubway was launched last week. I had to run some errands in the Kenmore Square area yesterday afternoon and instead of taking the bus, I thought it would be great opportunity to try out the bike for myself. I looked up the Hubway station closest to my residence. The map on the Hubway website said that it was at the intersection of the Soldier’s Field Road and Western Avenue on the Harvard University Campus. It took quite some time locating the bike station when I reached the intersection. I had assumed that the bike station would probably be at the parking lot nearby based on the pointer on the map but I had to wander about a bit before I located the bike station inside the campus. It was much easier to navigate through the registration process on the kiosk and rent a bike at the station. I took the bike and rode to the closest intersection where I could cross over to the Charles River Bike Path along the Charles River and merge with the rest of the bike traffic. I came across the first incident that made me realize all over again why it is difficult to bike in Boston and why casual riders who decide to rent a bike in Boston and bike along the major roads should be careful. A lady driving a car had just missed the green and was stuck in the middle of the intersection I was waiting it. The signal was also a ‘walk’ sign for me, other bikers and pedestrians to cross over to the other side and most of us had started walking when the lady startled all of us by braking to let us pass and suddenly starting her car again and driving past before we could cross, screaming apologies on the way. 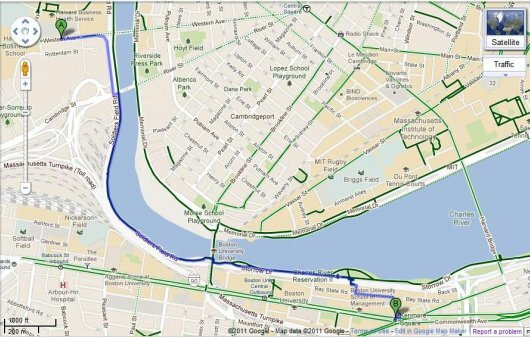 I decided the path I would take to Kenmore Square- ride as far as I can along the pleasant Charles River Bike Path on the Boston side of the river before I had to turn into the Commonwealth Avenue to reach Kenmore Square. I usually like avoiding the Commonwealth Avenue where there is intense bike traffic. I am not going to go into all the arguments surrounding the use of shared space for bikers, pedestrians and car drivers in Boston but would like to speak about the idea of bike sharing itself and the kind of impediments I came across when participating in the bike sharing program and the views of what other users felt about it. It is my belief that the scheme would attract a lot of casual bike riders in the initial stage who are unfamiliar with bike laws and bike paths in Boston. While it is a welcome initiative to encourage as many commuters to start riding bikes instead of cars, there would have to be enough care taken to make sure that the anticipated rise in bikers could be accommodated by the bike paths and there is no rise in accidents along the way. 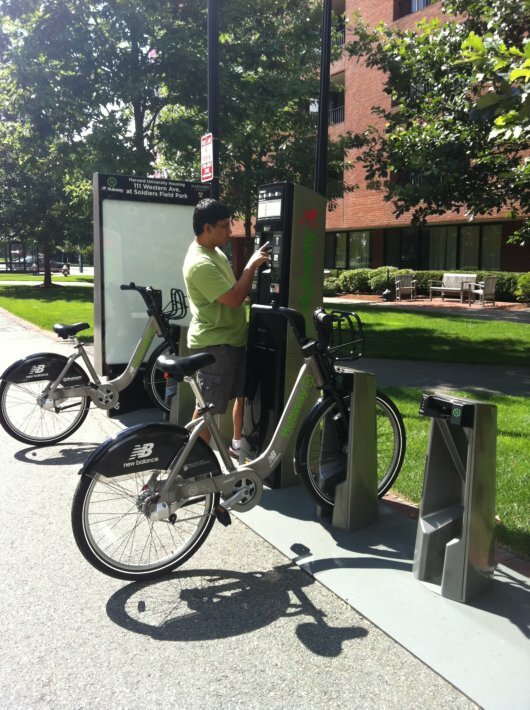 I met a couple of students from the summer school in Harvard who had rented the Hubway bikes from Allston and were trying to locate a bike station close to the Western Avenue. They had internet access on their mobile phones and were trying to locate the address. One of the students, Kwang Le said that he was finding it difficult to locate the Hubway station using the GPS. “The GPS is not giving me the Hubway station’s location. Also, it would be nice to have a cup-holder on the bike to carry water with me,” said Le. For a bike sharing scheme where the bike rates keep escalating with every hour that passes by, this information could be crucial. However, Le said that he liked the bike sharing idea and thought it was good for the city. His friend, Bonnie Leung seconded his opinion about the bike sharing program but felt that the bike handles were a bit heavy. 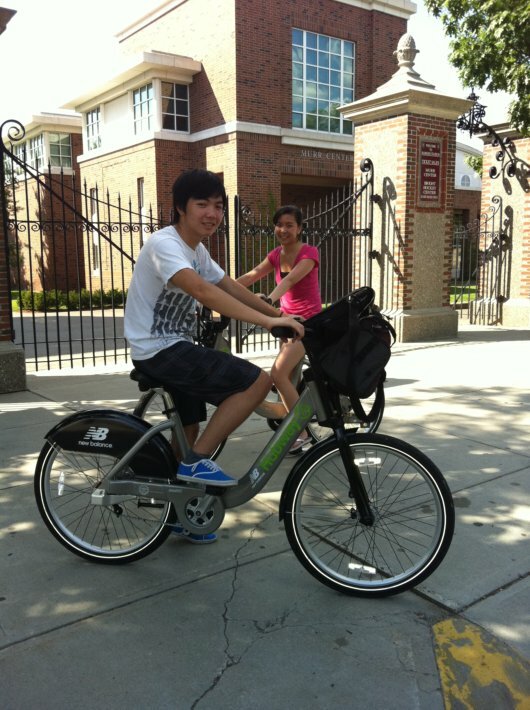 Harvard Summer School students Kwang Le and Bonnie Leung trying the Hubway Bikes. Another student, Anish Bivalkar, who had rented the bike to go to a grocery store said that when he reached the store, he realized that there was no Hubway bike station nearby and he could not lock the bike while he did his grocery at any other bike stand. “I did not find a lock on the bike that I could use at a non-Hubway bike stand. I guess, if I am renting the bike again, I would have to bring my own lock or end up paying for the bike if it gets stolen,” said Anish. These were valuable inputs for me. I came back to the Western Avenue bike station with even more curiosity about how this program would work out in Boston and its neighborhoods. I am not sure what other issues would come up as this program evolves, but I, for one, would love to see this program work out. Post and photos by Alpita Masurkar. more stations covering more of the Boston area, and covering common cycle routes like both sides of the Charles river for example. And It really is key to know whether where you’re going has a station as well. The Spotcycle app for iPhone and android shows all stations and has real time bike and open stand availability. Great app, and it works with other cities’ bikeshare programs (though not all other bikeshare programs).